How do I find my electricity or natural gas supplier? Who is my energy provider? Sooner or later, you will need to know where your energy comes from. Whether you’re moving to a new home or just want to sign up with another electricity or natural gas supplier, you will have to find out who your energy provider is. The natural gas bills. Your average kilowatt-hour (kWh) usage. The electricity supplier … Some things seem so simple that we don’t even think about them in day-to-day life. Well, at least until you need to face those questions. If you’re having trouble trying to find who is your natural gas or energy supplier in Alberta, you will need to take a look at some specific details on your monthly energy bills. But don’t worry, EnergyRates.ca will make it easy for you, and show you the most straightforward ways you can find out who provides you with energy. Who provides energy in Alberta? Before you start searching for your energy provider, you should understand the difference between the wire service provider and the energy supplier (also known as the retailer). In Alberta, two different groups provide energy for homes and businesses: retailers and wire service providers. Each one of them, however, have very different jobs in that process. The retailer is the company that sells energy to you. Think of electricity and natural gas as products: The retailer is the company that sells you those products for a specific price. These rates can change every day and are affected by many factors connected to the energy industry, including environmental issues and political decisions. The retailer is the company that provides you energy. If you want to find out who is your electricity or gas supplier, there will probably be a logo or brand name on your bill, such as Encor by EPCOR, ENMAX, Direct Energy, ATCO, Spot Power, etc. In Alberta, consumers have the freedom to choose who they want to provide them with electricity and natural gas. Such companies fall into two main categories: the regulated-rate provider (RRO) and competitive provider. When it comes to natural gas and electricity in Alberta, you can choose to sign up with different companies or purchase such services in an energy bundle. However, if this is your first home in the province, you are probably with the local regulated provider for each commodity, also known as the default provider. Each area has a specific regulated provider for gas and electricity, which makes it easier for you to find who could be your energy supplier. For example, in Edmonton, the RRO electricity provider is EPCOR, whereas in Calgary, the default electricity provider is ENMAX. Depending on where you live, the regulated-rate provider could be the municipality, which is what happens in the City of Lethbridge. As you learn more about the Alberta energy market, you will start noticing that competitive and regulated retailers often belong to the same energy group. Still, they are different companies with different plans. An interesting example of such a difference is the Direct Energy case. Customers under the competitive Direct Energy plan receive a blue bill, while consumers under the Direct Energy regulated services receive a pink bill. The wire service providers (WSP) are the companies responsible for transmission and distribution. In other words, these are the companies that move energy from generators to your home. The transmission charges are related to the costs of transporting electricity from generators to high-voltage local distributors. The distribution charges, on the other hand, come from the costs of bringing energy from the local distributors to your home at a low voltage. Although the costs related to distribution and transmission fees may represent a considerable part of your monthly bills, there isn’t much you can do about them. These fees are approved and regulated by the Alberta Utilities Commission (AUC). Seeing that Alberta is a deregulated energy market, many consumers assume that they will be able to switch their wire service provider the same way they do with retailers. However, Alberta residents can’t change their wire service provider. There is a specific WSP for each region in Alberta — and their distribution and transmission rates are the same within that area, as they are wholly regulated whether by the provincial government, local municipalities or rural boards of directors. Find out below who approves and regulates the distribution and transmission costs in some Alberta regions. Important note: The WSP and the energy retailer can be part of the same group, but can also be totally different companies. As an example, any customer in Edmonton will have EPCOR as their wire service provider, but could have any retailer of their choice, such as ATCO, Direct Energy or ENMAX, as their energy supplier. Usually, electricity and natural gas retailers will let you know in the bills which company is the wire service provider in your region. If your bill doesn’t say who’s the WSP, there are high chances that it’s the same as the default regulated retailer in your area, whether for gas or electricity. Now that you know the difference between retailer and WSP, you’re probably asking yourself how to find who is your energy provider. In order to figure it out, get one of your recent energy bills and take a look at two things: the logo or brand name, and the site ID. The logo or brand name will show you who the energy supplier is. Usually, you will find the logo printed on top of your bill. In case you want to talk about something related to electricity or natural gas rates, or anything else pertaining to your energy plan, you should call this company. In order to find out who’s the wire service provider, look for a “delivery charges” or a “distribution services provided by” section. The information in this area will tell you who’s responsible for transporting electricity and gas into your home. 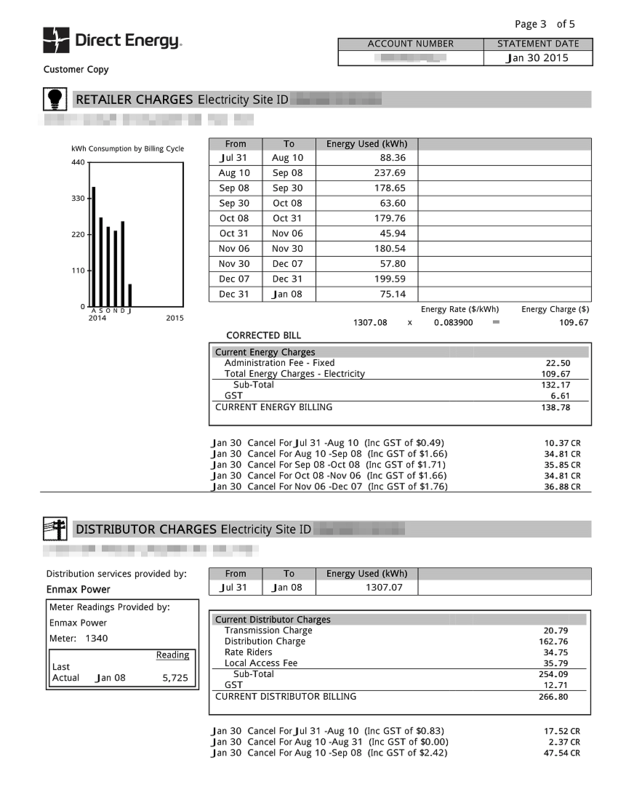 Below, you can find a sample bill taken from the Direct Energy website. On the example, you can see the customer is signed with Direct Energy (the retailer), but their electricity is distributed by ENMAX Power (the wire services provider). What if my utility bill doesn’t tell who’s the energy distributor? Even if your energy provider doesn’t tell who’s the WSP in your area, there are other ways you can figure it out. In that case, you will need to find the site ID on your bill. The site ID is a 13-digit number that every site in Alberta must have. This is a way power companies found to identify their customer’s properties in a unique way. Every property connected to a meter in Alberta has a site ID for electricity and another one for natural gas. This number is not only a unique identifier for your property; it also reveals who is the distributor in your area. Most energy bills come with the site ID in the top corners of the page, next to your personal information or to the retailer charges. Depending on who’s the provider, the site ID will begin with different numbers. Each distribution company in Alberta has a number. The first digits of your site ID will tell you who’s the WSP in your area. If your bill comes with an 11-digit site ID, the first two digits tell you who is the wire service provider. On the other hand, if the site ID on your bill has 13 digits, the first four digits will tell you who is your WSP. If you want to find out what’s the energy distribution company in your address, check the table below. Quick tip: You can differentiate the electricity site ID from the natural gas site ID quite easily. In most cases, the site ID for electricity services begins with one (0) or two zeros (00), whereas, the side ID for natural gas begins with three zeros (000). In case you still have doubts, check below another sample bill. In this example, the customer has both their electricity and natural gas provided by ENMAX Energy. However, based on their site ID, we can see that the electricity is delivered by ENMAX Power (site ID begins with 0020) while natural gas is distributed by ATCO Gas (site ID begins with 0003). What electric company services my address? If you’re not satisfied with your electricity and natural gas bills in Alberta, there is a lot you can do to find the best energy providers in the province. Whether for electricity or natural gas, you can compare Alberta energy utilities and their rates at EnergyRates.ca. The website is a cost comparison tool that lets you find the best current rates for electricity and natural gas providers by postal code. Once you fill in your Alberta postal code, the website will list all the major natural gas providers in the province for both floating- and fixed-rate residential plans. Consumers looking for small business, commercial or industrial electricity and gas suppliers can even get a custom rate comparison report.